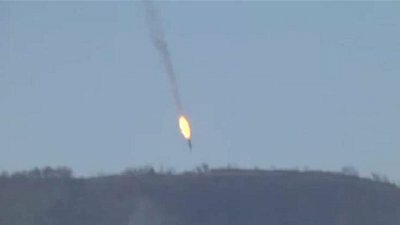 A Russian jet has been shot down after reportedly violating Turkish airspace near the Syrian border. The jet’s pilot was warned before being shot down, according to a Turkish military source. However, Russia’s defence ministry has said the Su-24 jet did not violate Turkish airspace, the RIA news agency said. According to Interfax the ministry also said the pilots managed to parachute out, but their fate is unclear. The warplane went down in an area known by Turks as “Turkmen Mountain” in northern Syria near the Turkish border, private broadcaster Haberturk said. A statement from Turkish Prime Minister Ahmet Davutoglu’s office said the leader spoke with Turkey’s military chief and foreign ministry about the incident. It added Mr Davutoglu would start “initiatives” within NATO and the United Nations.